Back in May 2013, Sony officially announced a secret project that must of us already knew: Gran Turismo 6 would be released this winter. However, there was a catch in that the game wouldn't be coming to the PlayStation 4 like some expected but rather to the PlayStation 3. While DriveClub may satiate the hunger for racing fanatics on the PS4's launch on November 15th, 2013, Gran Turismo diehards who were planning on selling their PS3 for a PS4 are feeling the sting of missing out on the next entry in the series. What Are PS4 Fans Missing? Gran Turismo 6 looks to be the culmination of everything Sony has done with the series so far in addition to wrapping in some social features, which is the PS4's domain. Every car and track from Gran Turismo 5 will make an appearance in 6, bringing the total car count to over 1,200 and the total track count to over 33 tracks with 71 different layouts. Truly, this is the biggest Gran Turismo game yet. Since the PlayStation 3 has no real social features, Sony is bringing out companion applications on smartphones and tablets, presumably to let you view statistics and issue challenge when out and about. Like on any new model car, the game is getting a tune up under the hood with some engine modifications. For example, both the physics and graphical engines are being revamped, providing a more realistic driving experience both in the visuals and gameplay. Series creator Kazunori Yamauchi sums up the game perfectly in the press release that accompanied the game's announcement: "It is amazing to think that it is 15 years since we first released Gran Turismo. Things have changed a lot since then and now Gran Turismo 6 is a further evolution of my dream. 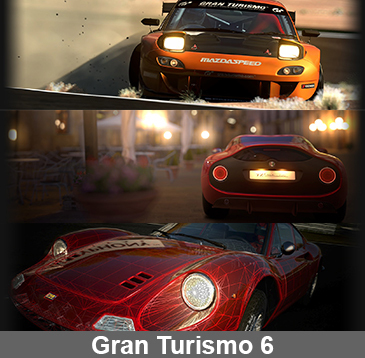 We're pleased to deliver GT6 to PlayStation 3 as we have a very loyal community on that platform." Why Isn't Gran Turismo 6 On PlayStation 4? Even though Sony has a loyal community on the PlayStation 3, the early adopters for the PlayStation 4 are among the loyalest in Sony's legion, dropping major amounts of coin on a brand new system at launch. Surely they deserve a Gran Turismo as well? In an article released around the time of the Gran Turismo 6 announcement, IGN clarified why GT 6 on the PS3 makes sense for a number of reasons. The biggest reason is that Gran Turismo 6 has been worked on since 2010, long before PS4 development kits were available; it now makes sense why Driveclub is the PS4's launch racing game and not Gran Turismo 6. Will Gran Turismo 6 Eventually Hit The PlayStation 4? Depending upon who you ask at Sony, the answer is either yes or no. At a Gamescom panel, developer Polyphony Digital's CEO Kazunori Yamauchi mentioned that the game could very well evolve into Gran Turismo 7 on the PlayStation 4. However, president of Sony Computer Entertainment Worldwide Studios Shuhei Yoshida mentioned to IGN that the game was all but coming to the PS4, stating that Gran Turismo 6 will come to PS4 when Polyphony Digital is comfortable with the system. If you're waiting for Gran Turismo on the Vita, however, you're in for a long wait as all parties have mentioned there are no plans for a Vita version. Keep it locked to PS4 Experts for any Gran Turismo updates for the PS4! I think the GT6 will be release 2015 or 2016 by looking at the time between GT4 and GT5, but PS4 will definitely support PS3 games with a little goodies like better graphic new controls or even better 3d support... Since new controller, new gaming support can be build anytime, I think Sony should definitely release the PS4 next year and make it to be upgradable, something like its graphic card is upgradable and can be easily replace that new graphic card will be likely to release every 2 years. lol GT6 will take longer than it took for GT5 to be released. That announced that game before PS3 was available and it took years for them to release it. Maybe casue they were working on 6 when they weren't even half done with 5.